Love that beautiful big circle in the middle! For my card, I decided to go with some bright colors and a bit of Copic coloring. I started with a white card base then added a layer of Fog cardstock. The circle was cut from some Slate cardstock then stenciled with some translucent embossing paste to add a bit of interest. The umbrella was colored with Copics and then fussy cut. I originally used the matching die to cut it out but it slipped a bit in my Big Shot and the white edges weren't even, so out came the snips! The umbrella is popped up on foam tape. 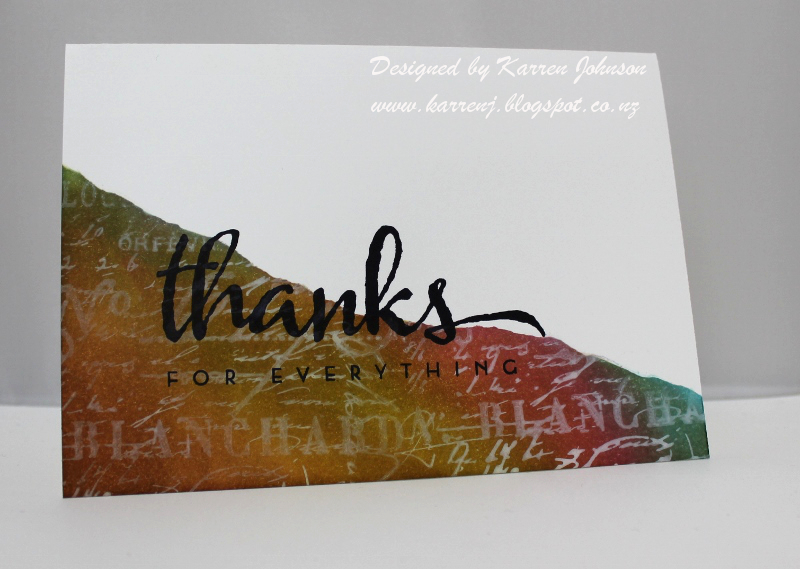 The sentiment is white embossed and the flags were cut using cardstock which matched the Copics as close as possible. Thanks for visiting. 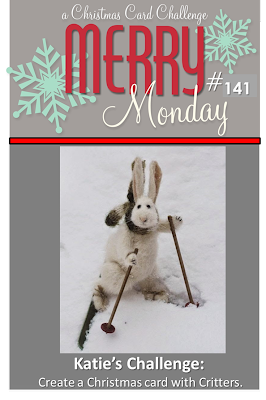 My fellow teamies have some wonderful inspiration to entice you to give this fun sketch a try so be sure to check them out. 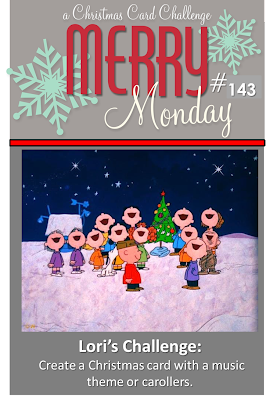 Today's Merry Monday challenge comes to us from Lori and she is asking us to use carolers or music on our cards. I've had the Snowy Trio stamp from Purple Onion for nearly a year and hadn't used it, so this was the perfect opportunity to get it out and spend some relaxing time coloring. I just adore this image! The snowmen look so joyful and happy! I stamped the image onto some X-Press It cardstock using Memento Tuxedo Black, then spend a good amount of time coloring with my Copics. The sentiment comes from a cute little Simon Says Stamp set I got from my Merry Monday Secret Santa (Sue) and was stamped using Jet Black Archival ink. 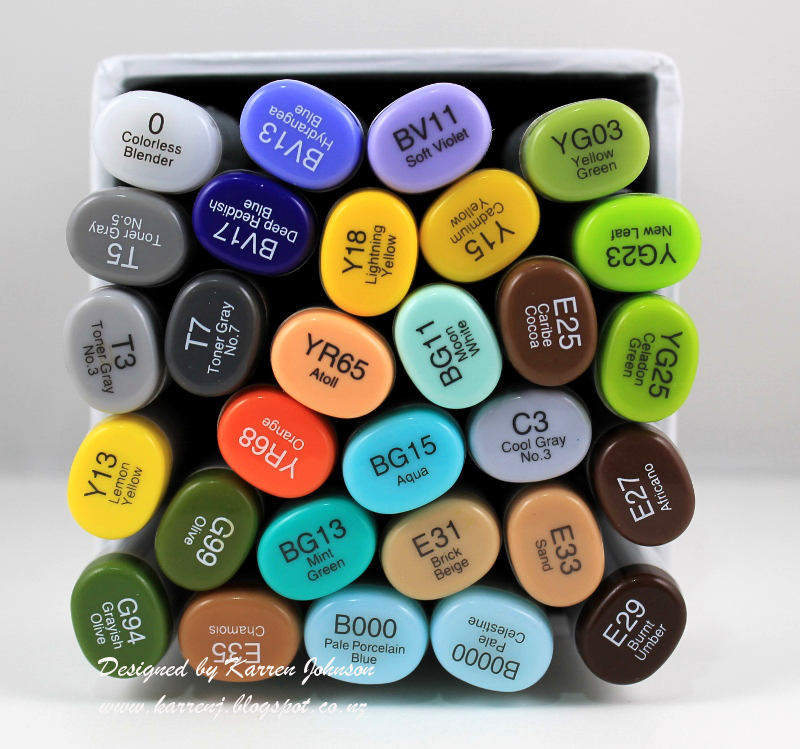 Here is a photo of the various Copic markers I used in this card. Thanks for visiting. The Design Team have some adorable musical cards to entertain you, so be sure to check them out. Once again I went CAS with my card. 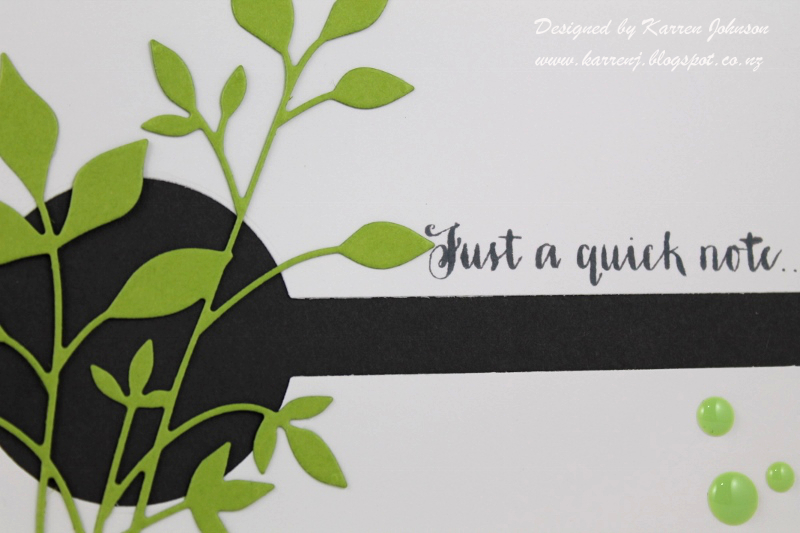 I just got a wee pile of new Memory Box dies so I went through the pile and chose the Surely Stitched Circle die and the Fresh Foliage dies and my card came together in about 10 minutes! I used the circle die to cut the panel from the white card base and then adhered some Slate cardstock behind the card front. 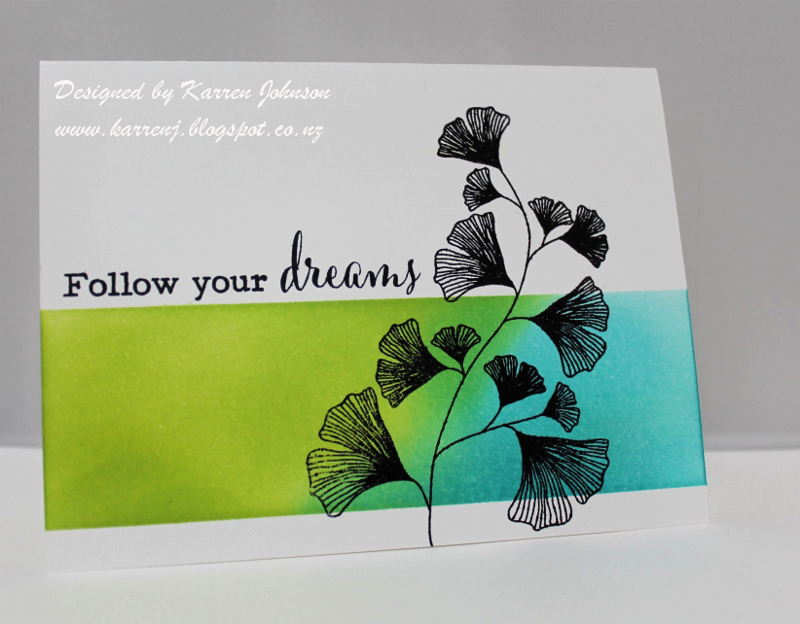 The sentiment was stamped with Slate ink and then the foliage was added to the top. Easy! Thanks for visiting. The rest of the design team have some wonderful interpretations of this fun sketch so be sure to check them out. My first full week of work after 5 months off has gone by and it's the weekend - yahoo! After doing laundry this morning, I escaped into my craft room and cranked out five cards. Four of them are for upcoming DT challenges so you'll see those in due course, but the fifth one was just for fun and to enter a few challenges. I used the colors from Color Throwdown, the cue word from CASology and the sketch and theme from Just Add Ink to come up with this card. I know that the friend sentiment isn't necessarily romantic love but I hope it still qualifies at Just Add Ink. To make my card, I first stenciled some embossing paste over the Tim Holtz Measured Stencil onto both my card base and the blue tag. 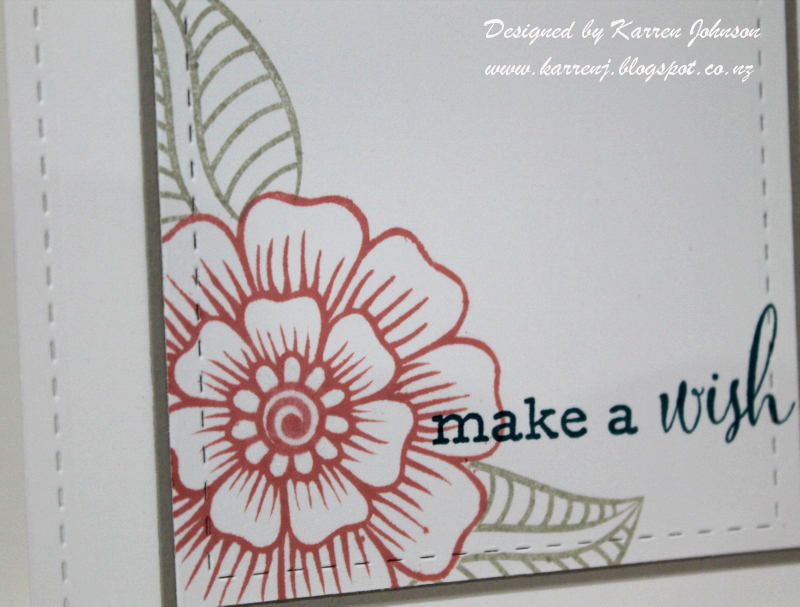 I stamped the flower using Rose Red ink stamped off and full strength. The leaves were stamped using Lucky Limeade. The friend sentiment was made with a Dymo labeller. Edited to Add: This card got top honors at Just Add Ink. Hi and welcome to Freshly Made Sketch Challenge Day! 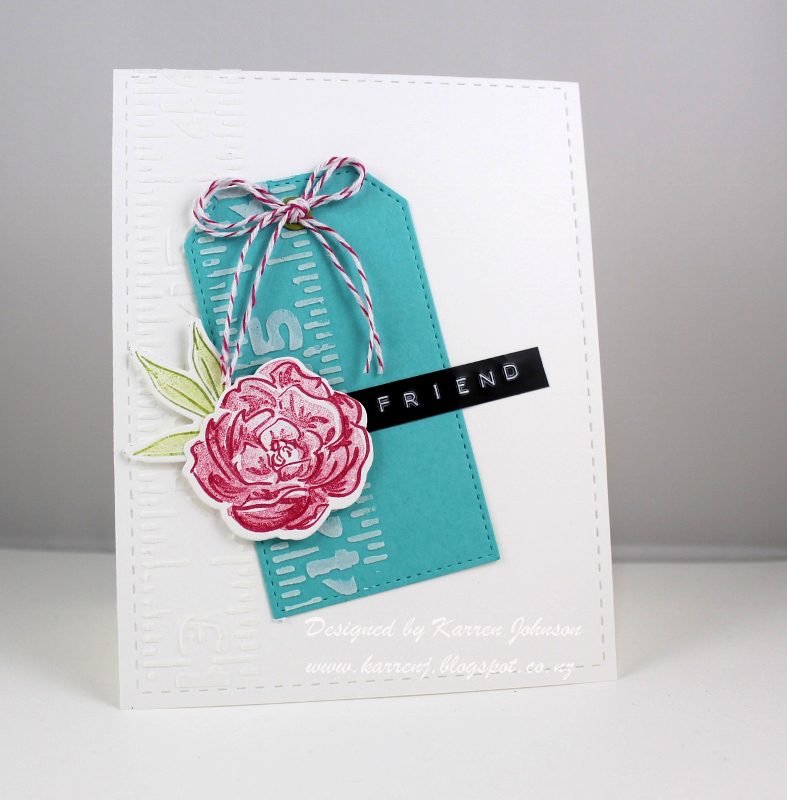 Today, our sketch comes to you courtesy of Jen Mitchell, who has an amazing ability of taking grunge stamps and making the most beautiful clean cards! 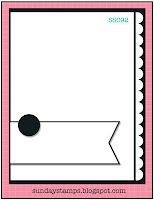 For my card, I decided to make a baby card as one of our neighbors is due to give birth to her first baby in February. They don't know whether it's a boy or a girl, so I kept to neutral tones for my card. 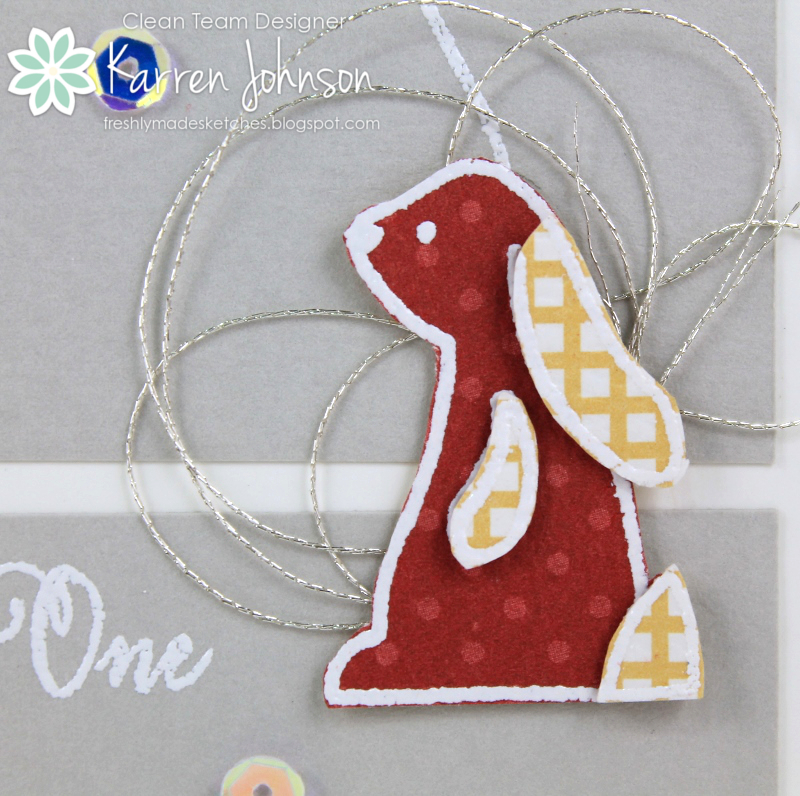 I stamped and white embossed this cute little bunny onto two patterns of paper and fussy cut them out. I used the second pattern for the ears, arm and tail as well as the balloon. I white embossed the sentiment on a piece of Fog cardstock and adhered that plus a larger piece to my white card base. Some randomly arranged silver thread and sequins finished off this CAS card. Thanks for visiting. 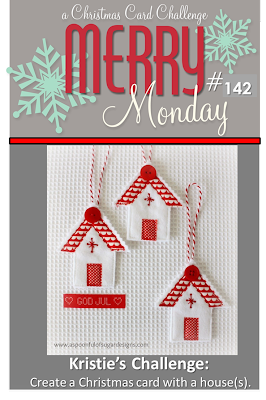 I'm linking this up to Avery Elle's challenge this month which is all about paper piecing. 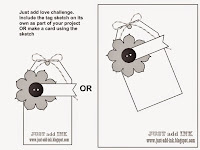 The rest of the FMS design team have some fabulous cards to encourage you to give our challenge a go, so be sure to check them out. Hi and welcome to Merry Monday. Today's challenge comes to us from Kristie and she is asking us to use a house or houses in our card. 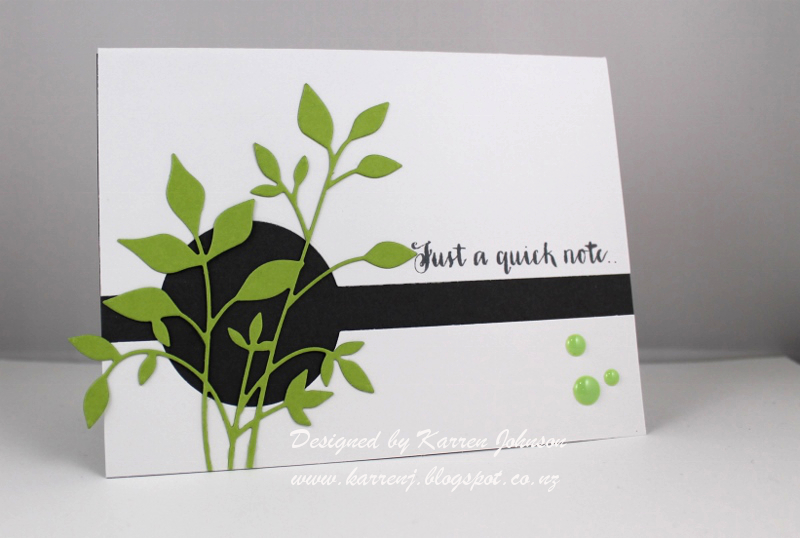 For my card, I went very, very CAS, creating a one layer card with just two stamps and a tiny bit of Copic coloring. I first stamped the sentiment in the bottom left corner and then I stamped the image. I colored it with my Copics very quickly, using little to no shading. And that is it! 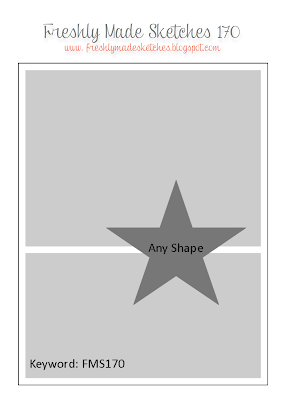 Totally flat for mailing. Thanks so much for visiting. Be sure to check out the fabulous examples from the rest of the the Design Team. Hi and welcome to week 3 of my stint at The Paper Players. 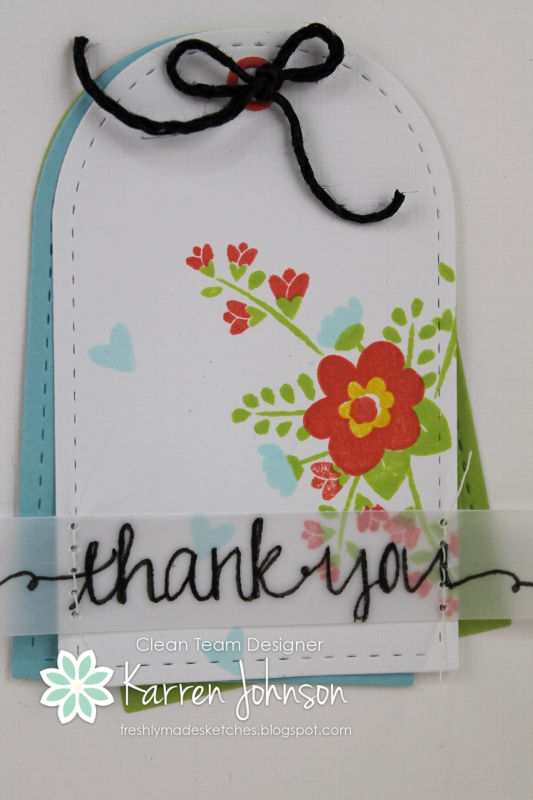 This week, LeAnne is challenging us to create a CAS card where the sentiment is the main focal point. I started with a white card base and masked off the top part by using some torn paper. I then sponged various Distress Inks onto the bottom of the card. To tie the colors in together a bit more, I went over the whole lot with Vintage Photo then went back over with the original colors. I think that gave it a more cohesive look, considering I used everything from pink to green to rust to blue. Once I was happy with that, I inked up the Papillon stamp with Picket Fence Distress Stain then stamped it over the masked piece. I let it dry naturally to give it more transparency. 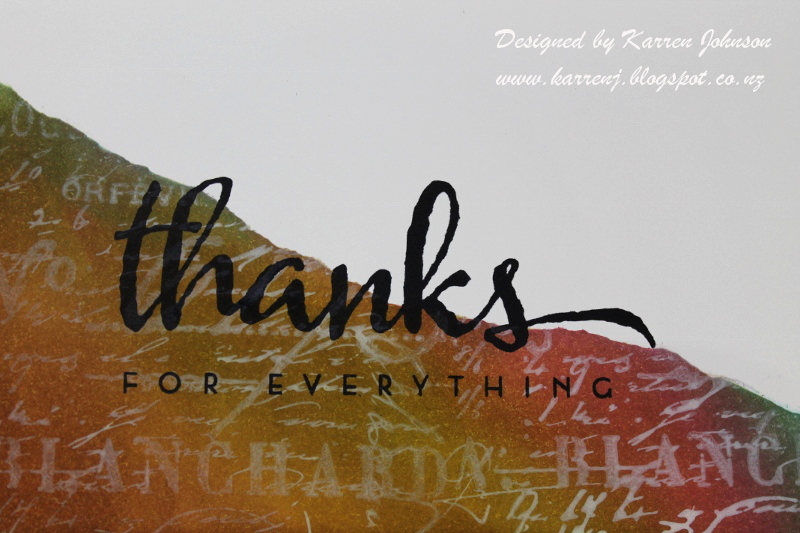 The sentiment comes from two sets: The Big, the Bold and You for the "thanks" and Wet Paint for the smaller words. Thanks for visiting. Be sure to check out the wonderful cards made by the rest of this talented design team. Hi, it's a scorching hot Sunday afternoon here and the only thing to really do is stay inside and stamp :) And just to clarify, by scorching I mean 31 degrees Celsius or 88 degrees Fahrenheit. I'm sure some of my friends in the Northern Hemisphere would love that right about now, but trust me, that's hot in my little corner of the world! 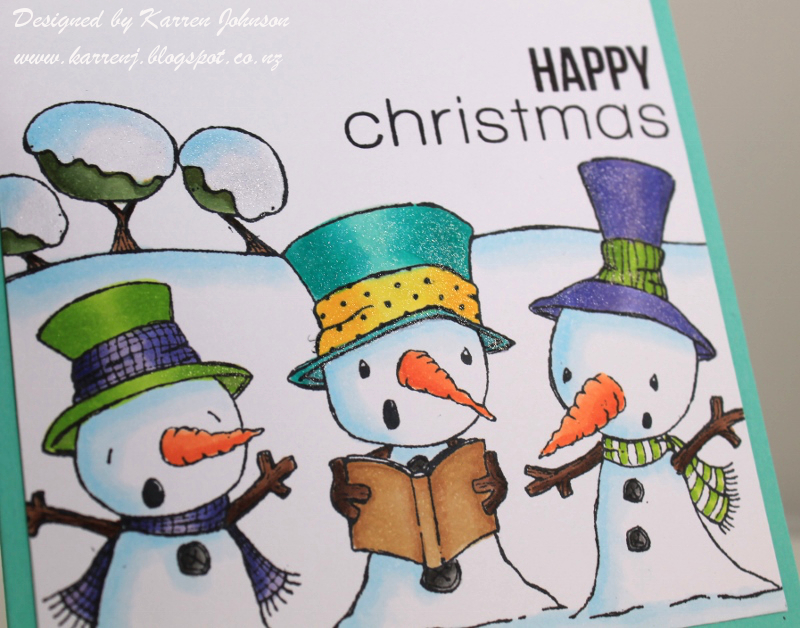 I stamped and colored this card yesterday, but didn't really like it so put it to one side for the night. When I came back to it today, it wasn't as awful as I thought and I only needed to cover up one poorly colored flower for me to think it was okay. I couldn't get the purple Copics to blend at all so my flower looked like a kindergartner had colored it! For the rest of the flowers, I didn't even attempt to blend! I fixed the purple problem by stamping it again on a scrap and sticking it over the top with glue dots. I also left the leaves intact and decided I liked that look so cut down the white panel to fit onto a Coastal Cabana card base. I went over all the flowers and leaves with clear Wink of Stella. Hi and welcome! It's Saturday here and I've just survived my first three days at work after a 5 month break. After getting laundry out of the way this morning, I couldn't wait to get into my craft room and do some stamping - my brain was too sore to attempt stamping after work! I decided to make a very simple card first up. 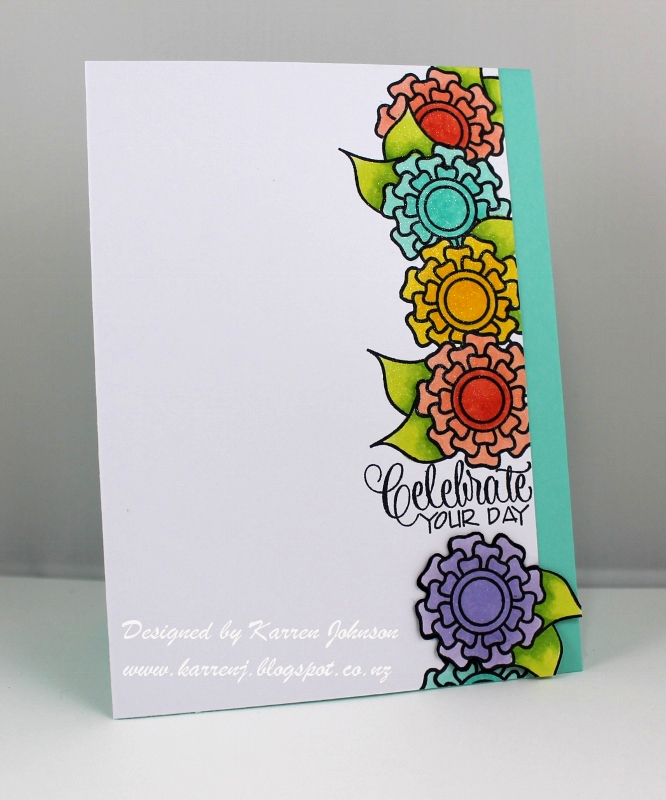 This card uses the inspiration from Stampin' Royalty and the sketch from Fusion. I have taken a few liberties with the sketch but I think you can still see the components in my card. I used the dandelion heads to represent the two circles in the sketch and the sentiment represents the horizontal panel. My card was layered onto a Pool Party base. I decided not to put any embellishments on it, thinking it was a nice graphic card that didn't need dressing up any. Hi and welcome to Freshly Made Sketch Challenge Day. 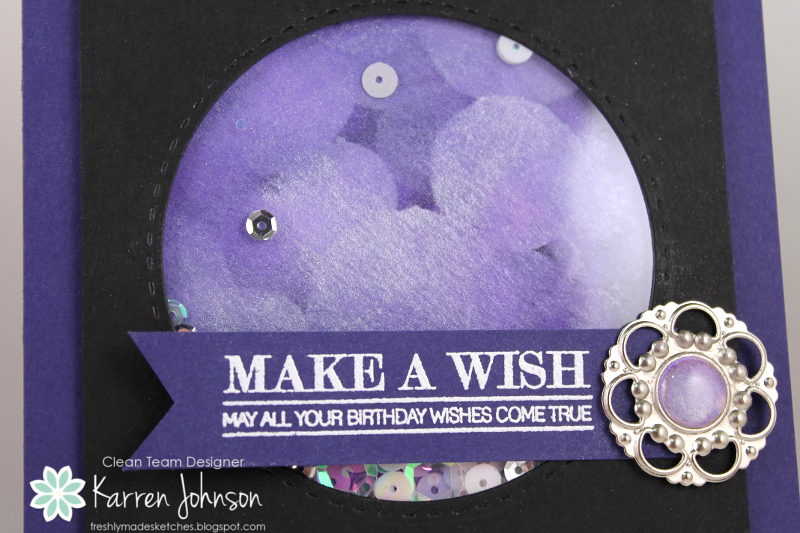 Today, our hostess is the super-talented cardmaker and aviator, Jennifer Timko. 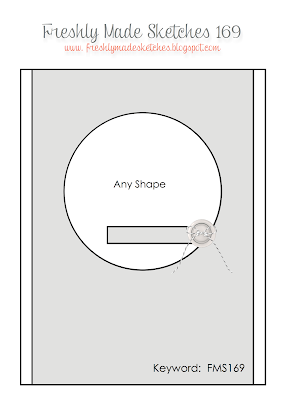 Jennifer has designed one of my favorite kinds of sketches - a full-length panel plus a circle element. Love it! I had an urge to make a purple card so splashed some purple watercolor paints onto a piece of watercolor paper and left it to dry. Once it was dry, I went over it with white ink and a a circle template to give the bokeh look. I had the card all ready to stick together when I had the idea to make a shaker card, so out came the sequins. I also went over the bokeh panel with some Perfect Pearls which gives it a lovely shimmer. The sentiment is white embossed and the inside of the builder brad is an offcut from the bokeh panel. Thanks for visiting. Be sure to check out the fabulous creations from the rest of the design team. They're all amazing! Welcome back for another Merry Monday post. 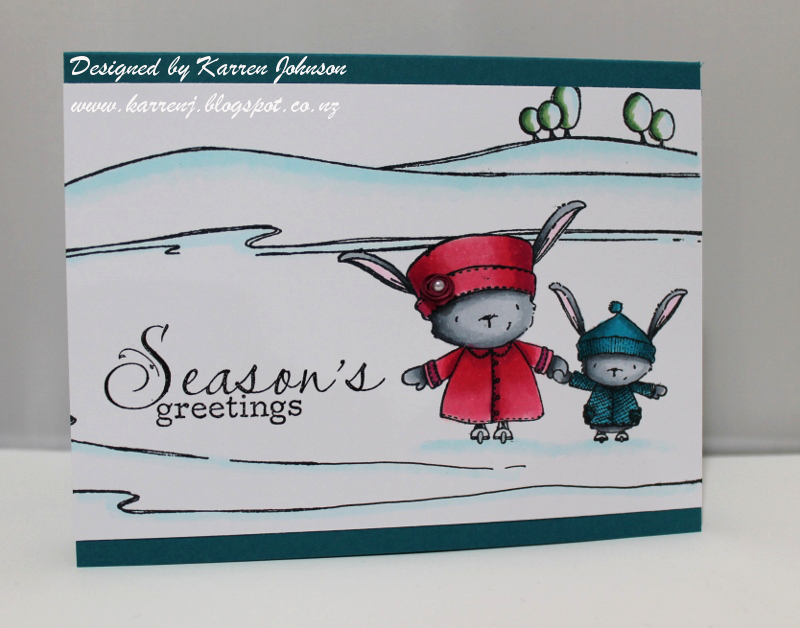 Today, the lovely Katie has challenged us to use critters on our cards. Fun, right? I stamped Cora and Thomas onto some white cardstock then masked the top of Cora's head before stamping the pond image over top. I colored the scene with Copics and used a very simple layout as the image is so big. 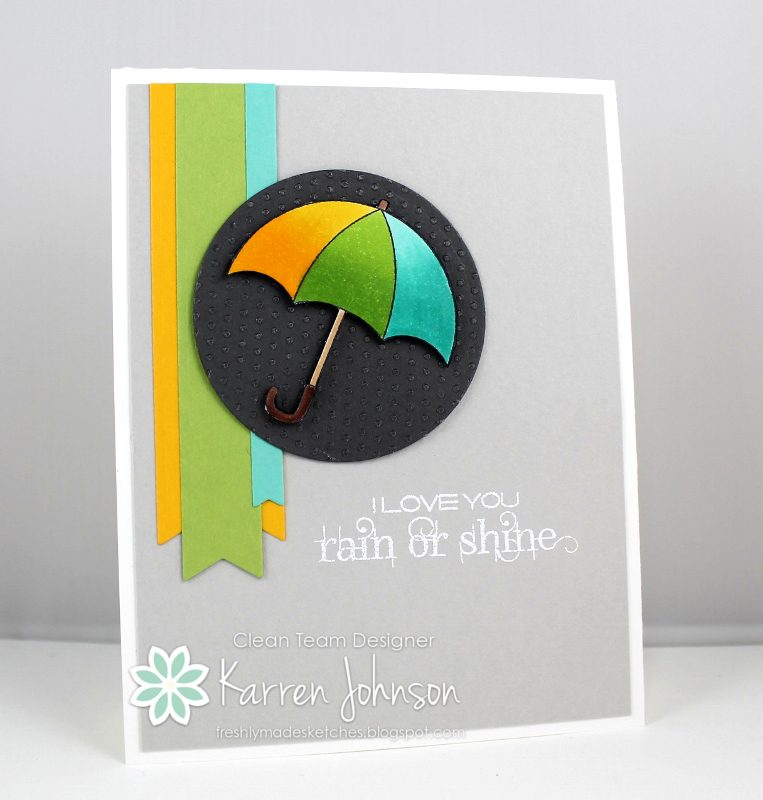 The sentiment comes from a Simon Says Stamp/Clearly Besotted collaboration. I made a tiny little rolled rose from some Rose Red cardstock and a 1/2" circle punch for Cora's hat. Thanks for visiting. The Design Team has some wonderful critter cards to inspire you. 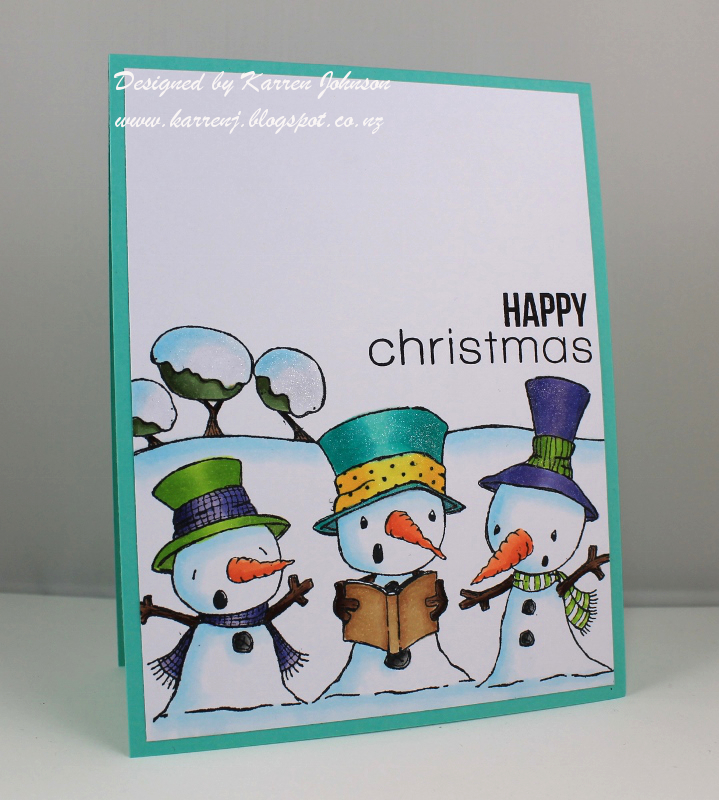 I masked off a section of a white card base and sponged on Green Apple and Audrey Blue inks. 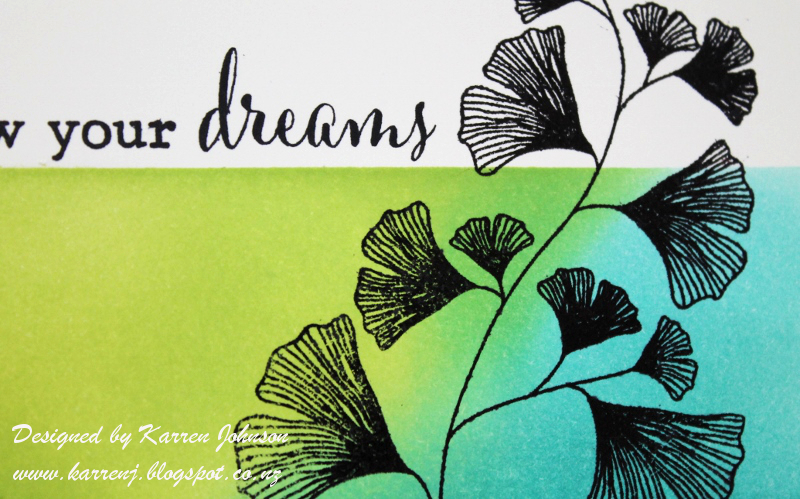 After removing the masks, I stamped the leaf in Archival Jet Black and the sentiment from Dandelion Dreams. I can imagine giving this card to someone just starting out on a new path in life. 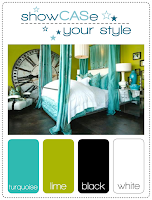 Edited to Add: This card got a shout out at ShowCASe Your Style. 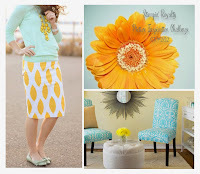 It's week two of my GD gig at The Paper Players and this week we have a color challenge for you to try. I went for a very simple card using the Hennah Elements set from Altenew. 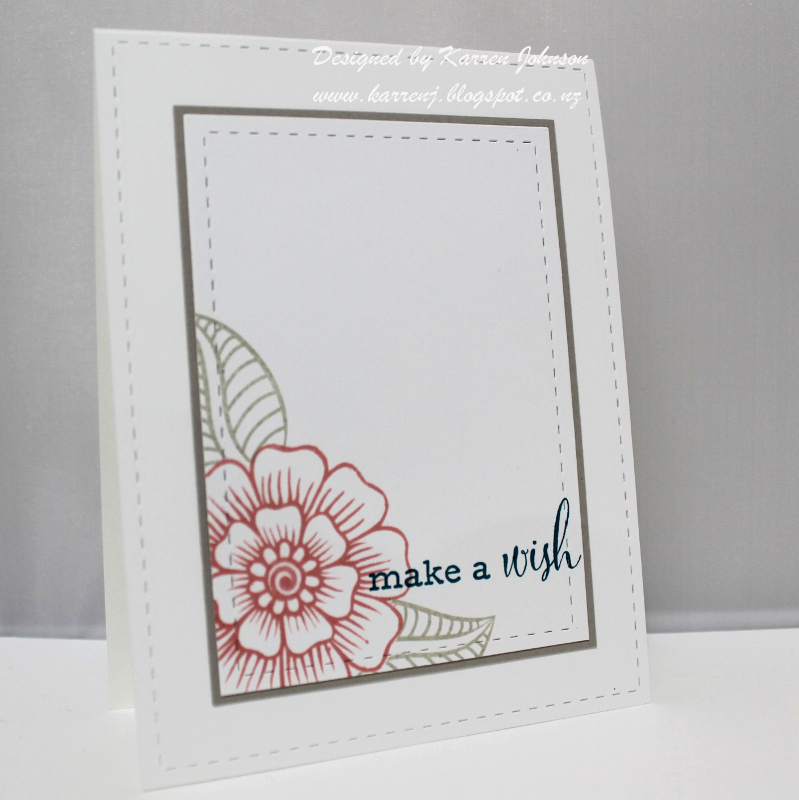 I stamped the flower in Crisp Cantaloupe onto a white panel then masked it before stamping the leaves in Sahara Sand. 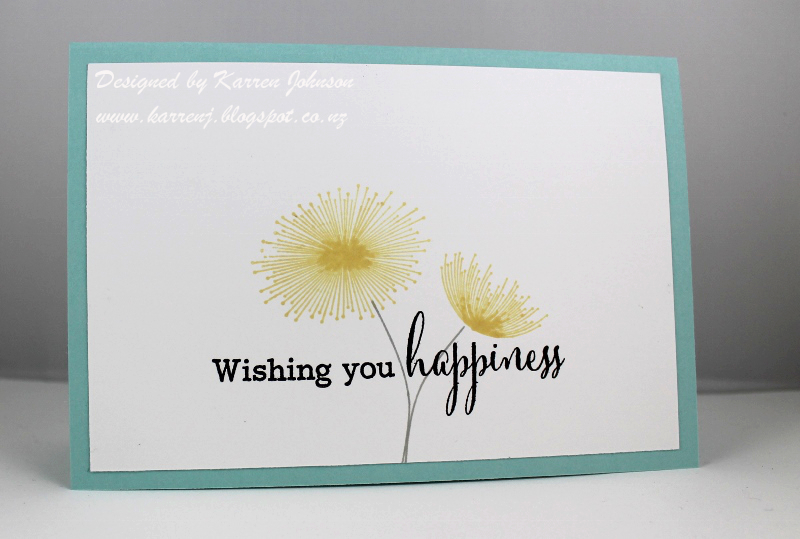 The sentiment comes from Dandelion Dreams by Clearly Besotted. I die-cut the panel with a stitched rectangle die then mounted it onto a piece of Sahara Sand. 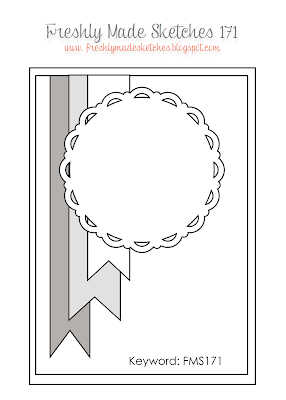 The card base was also die-cut with a stitched rectangle die. Thanks for visiting. The rest of the design team have some wonderful examples for you so be sure to check them out. 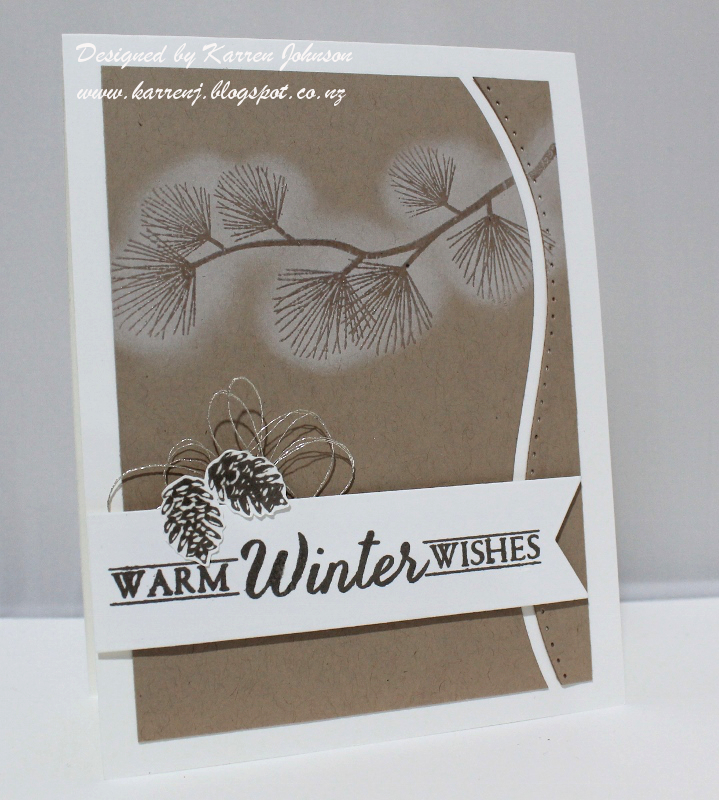 Warm Winter Wishes is an odd title for a blog post considering it's the middle of summer here, but this card uses the winter wonder theme from Curtain Call as well as the "winter" theme at Just Us Girls plus the sketch from Sunday Stamps so it's appropriate. I clear embossed the pine branch onto some Crumb Cake cardstock then used a sponge dauber and some white ink to sponge around the branch. I then cut the panel with a curved die by Spellbinders and adhered both pieces to the card base. 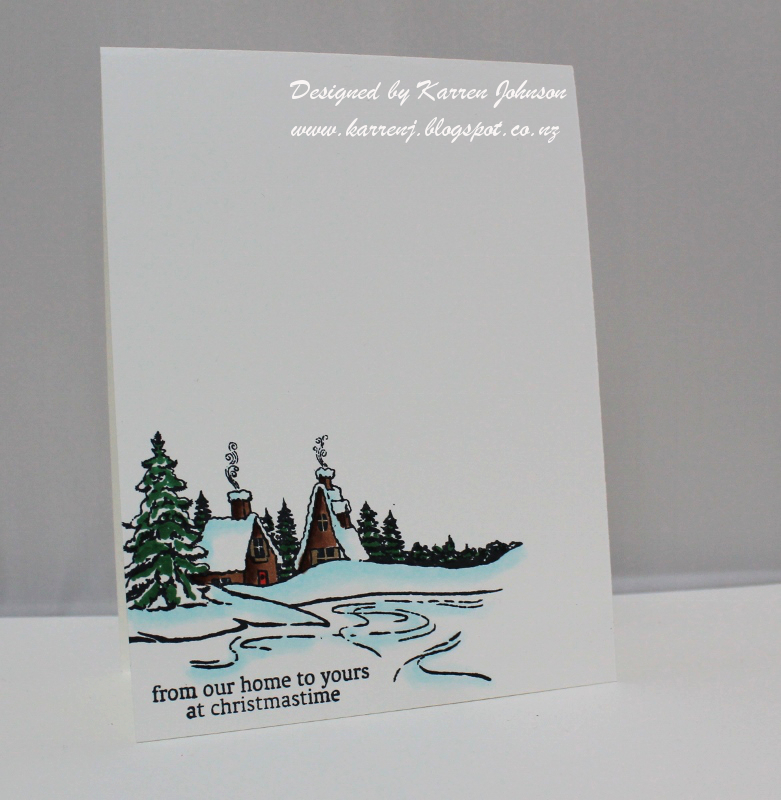 The sentiment was stamped in Sparrow ink onto a white panel and cut with a flag die. I stamped the double pinecones onto a white scrap and cut them out and stuck them to the flag before painting them with Wink of Stella. I then spent a ridiculous amount of time trying to get the thread to look natural and random! 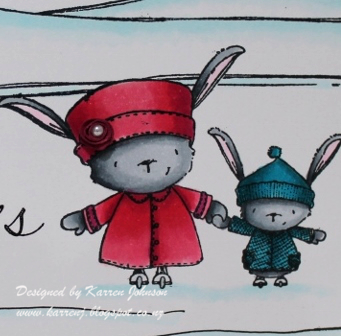 Welcome to our first Freshly Made Sketch challenge of the year! This challenge marks a year since I joined this team and what a wonderful group of people they are - love these girls! Anyway, on to the sketch, which this week comes from Amy O'Neill, who has the most amazing knack of combining colors the rest of us can't imagine. And they work! As you can see from my card below, I did take a couple of liberties with Amy's sketch. 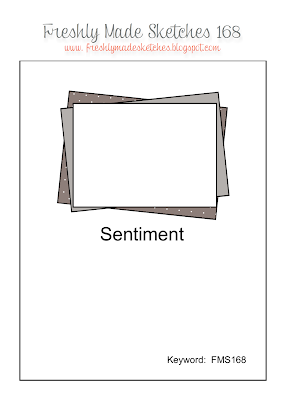 Firstly, I used offset tags for my central image and instead of the sentiment being on the card base, mine is on the tag. I think (hope!) you can still see the sketch? I used an Avery Elle set called Love Notes which is a builder set. 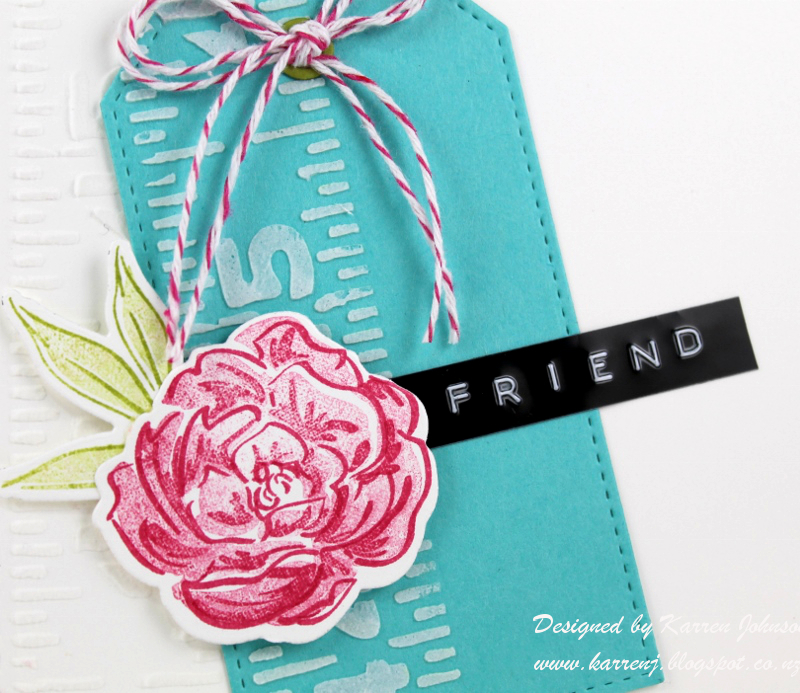 I stamped in various inks onto a stitched tag. I then stamped the sentiment onto vellum and stitched that onto the tag at each end to match with the tag's stitched lines. Plain tags were cut in Green Apple and Surf Blue cardstock and positioned behind the main tag and slightly offset. A cute little bow from black twine finished off the card. What is hard to see in the photo is that all the white layers were run through the Big Shop with the Canvas impression plate to give a subtle texture. Thanks for visiting. 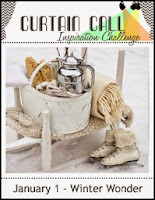 Be sure to check out the fabulous inspiration from the rest of the team.